This is my set up I have going in front of the TV. My DH (see footnote) is a huge movie buff so we're always watching movies (or baseball), and I feel the need to be productive at the same time. This is my bead board that goes nearly everywhere with me. 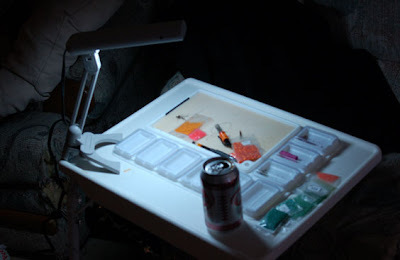 I was lucky enough to get my OTT-LITE from the Dallas Bead Society Holiday Party this past December. We sat in a big circle and someone read a story, and when the reader said "left" we passed our gifts to the person to our left, and the same for the word "right." I was sooo happy to end up with it! It is the best work light I've ever owned and I LOVE that it shows true colors. I can also angle it so I don't disturb DH's movie atmosphere. I set both of these on my Table Mate. My DH is geeky and has a computer hooked up to the TV as well. He was always wanting to set his keyboard on MY table! We had to get another one. These tables are awesome! Time to get back to work because my new shop is opening June 1st! Now you know exactly where I will be sitting. Footnote: DH is short of "Dear Husband" not "Designated Hitter" as I originally thought when I first started posting in forums! Yes, I LOVE baseball.